next March 31, 2015 5:40 p.m.
GPS and X-ray vision are so last century. DARPA's vision of the future has better chance than most of becoming real — this is, after all, the agency that was key to creating the internet. And every other year, DARPA gives a hint of what it thinks the future might look like when it releases a "Breakthrough Technologies for National Security" report, summarizing all the futuristic projects it’s cooking up and projecting the role they’ll play in the future. So DARPA is no longer striving to just build the biggest and baddest military machines. It’s also after agile, smart systems. The following 11 examples of coming developments represent both. Here’s how DARPA will change the world around us. 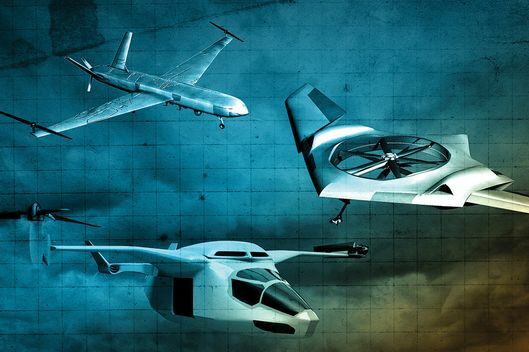 Planes are getting a makeover: DARPA doesn’t like that accessible technology is posing a threat to America’s “unchallenged standing as the world’s preeminent air power.” In response, X-plane prototypes are being developed with both the Navy and Air Force. Among them is an attempt to build a plane that harnesses the vertical take-off capabilities of the helicopter. They'll also deliver satellites to space: DARPA’s Airborne Launch Assist Space Access program aims to develop a streamlined system that relies on “unmodified conventional aircraft” to shoot satellites in space with just 24 hours notice. We’ll no longer be able to hide our nukes: In an effort to quickly and efficiently detect small nuclear and radiological weapons, DARPA is developing a system that can scan entire cities to see if anyone’s hiding a nuke in their closet. Damaged brains will get their own pacemakers: DARPA’s ElectRx program is developing ways to inject the human brain with tiny chips that would “bridge gaps in the injured brain, help overcome memory deficits and precisely deliver therapeutic stimuli” to patients with brain injuries. Can a Baby’s Foreskin Give You Youthful Skin?